This UK based Society was formed by a small group of collectors in 1982 and has grown to have members in countries across the world. We are passionate about collecting, spreading awareness and appreciating the beauty of Carnival Glass. We encourage research into its history and circulate information through our publications. 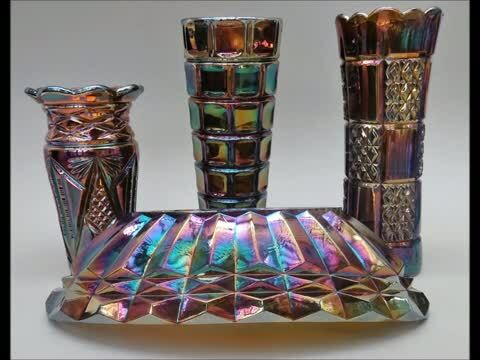 In 1916, when famous artist and architect Charles Rennie Mackintosh remodelled 78 Derngate for its new owner, famous model maker Wenman Joseph Bassett-Lowke, carnival glass was at the height of its popularity. Look out for items in this magnificent display that reflect Mackintosh’s designs including stylised flowers and striking geometric lines. (Click here for further information about the exhibition, location and opening times). Discounted admission charges which the Carnival Glass Society has negotiated with the organisers of some of the largest antiques and collectors fairs in the UK. 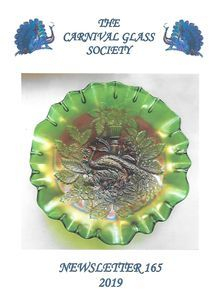 Two members of the Carnival Glass Society (or one member + guest) can attend each participating fair for the price of one admission ticket on production of a CGS 2-4-1 discount card. The discount card can be used on over 80 fair dates at 10 locations across the UK with significant savings available. More details. The Carnival Glass Society UK has negotiated discounted admission charges with the organisers of some of the largest antiques and collectors fairs in the UK. More information. Bounce into Spring with our 165th Newsletter, - and it's a 40 page bumper edition, crammed with articles, research, extraordinary finds and news of up-and-coming events. Click here for more information.